It has certainly been testing times in Brisbane for the 2018 Etchells Queensland State Championship. This regatta served as a warm up for the main event, the World Championship, which begins on October 21 for the 95-boat armada that has amassed to find out who is the best One Design crew on the planet. 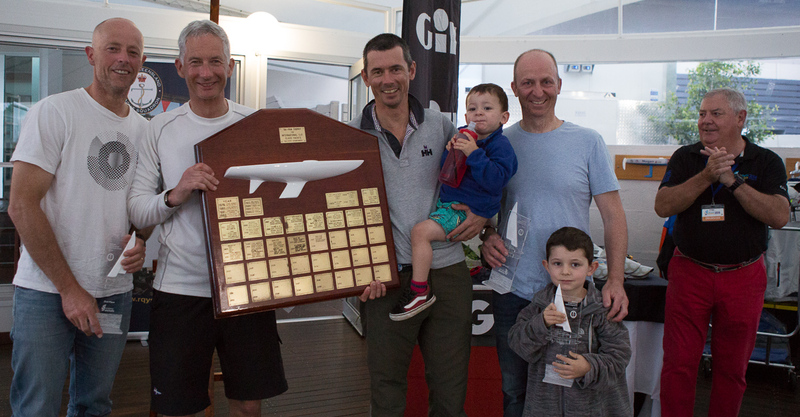 Winning the five-race pre-Worlds (as the QLD State Championship is known this year) is Iron Lotus (AUS 1442). Olympic Gold Medallist, Tom King, skippers her with crew, Ivan Wheen, David Edwards and Greg O’Shea. They are no strangers to the podium either, having previously won the 2012 World Championship, which was staged off Sydney Heads. Owen McMahon was on board then, instead of O’Shea, and Iron Lotus has also won the prestigious Australasian Championship in Mooloolaba, as well as the fiercely contested Victorian State Championship on the testing waters of Port Phillip. Iron Lotus (AUS 1442) is one of the new Pacesetter Etchells built by Australia II crewmember, Phil Smidmore. In this regatta they had two race wins, a tenth place and a third with an 18th as their discard, to secure a two point win over John Bertrand, Ben Lamb and Noel Drennan on board Triad2 (AUS 1440). In third place and a further six points astern was another boat, Havoc (AUS 1461) with another crew brandishing some real CV power. Namely, Iain Murray, Grant Simmer and Richie Allanson. “All credit has to go to Ross and Kevin Wilson and their Race Management Team for getting the racing in, despite the atrocious weather. They, the Brisbane Fleet and the host, Royal Queensland Yacht Club, have pit on a great regatta. We have been relaxed this regatta and enjoy ourselves and continue the theme”, said King of their plans for next weekend and beyond. So of those conditions then, and by and large they were squally and from the Sou’east. Race One on Sunday was held in about 20-25 knots from 115 to 125 degrees, where Triad2 kept out in front, even extending it slightly on the last run to secure good win. Further back in the fleet it was not so good, however, with one huge squall causing a few wipeouts and several rigs were broken. 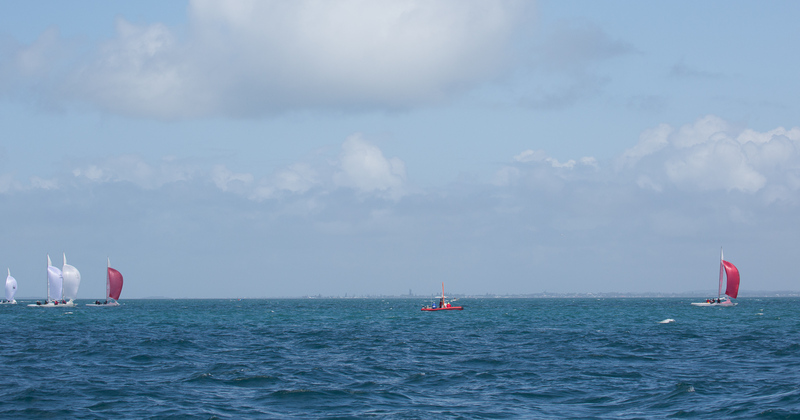 One race was also completed on the second day, and crews were held ashore for while before the Answering Pennant was dropped at around 1030hrs local. The wind ranged between 10-27 knots and from 110 to 130 degrees. The damage continued and the squalls were even more intense, yet overall things were more settled in between those. 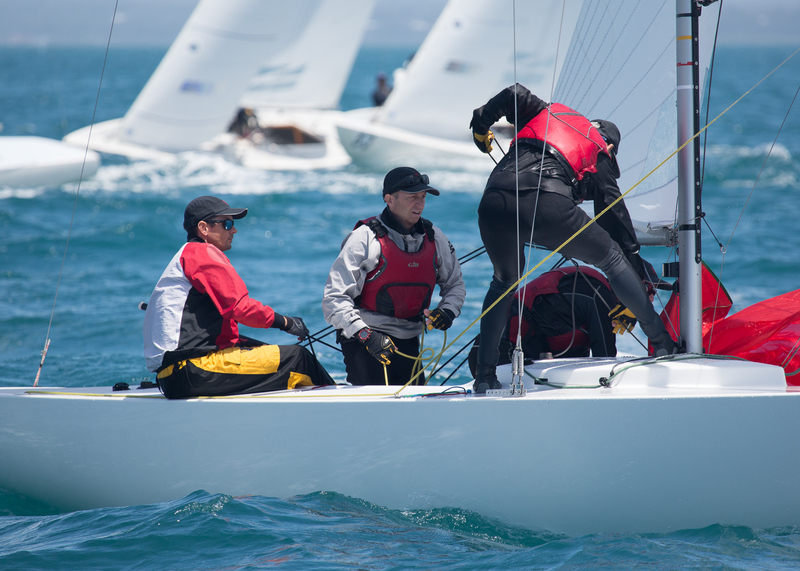 The Royal Queensland Yacht Squadron in the Brisbane suburb of Manly will host the 95-boat strong armada for the 2018 Etchells World Championship, as they tussle it out to see which crew reigns supreme. Racing begins in earnest on Sunday October 21, and concludes on Saturday October 27. Now to find out all you need to know about the boats, on the water, off the water, or to register to receive news, simply go to 2018etchellsworlds.org and click away! Iron Lotus (Red Spinnaker) with a real winning margin!